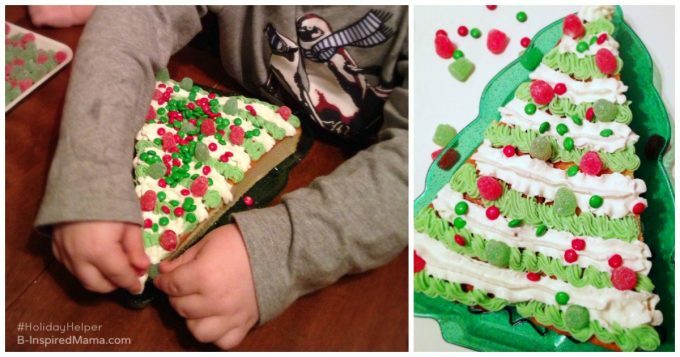 A semi-homemade Christmas tree-shaped Christmas cake recipe SO EASY the kids can make it themselves! It'll become their new favorite holiday tradition! Let pound cake thaw for approximately 10 minutes. (It's easier to cut and arrange if it isn't thawed entirely.) Leaving the cake in the foil pan, use a serrated knife to cut it diagonally into 2 triangles. Using a knife or kitchen scissors, cut downward into each corner of the cake's foil pan packaging. Bend the foil pan's sides down to make it easier to take your cake triangles out of the foil pan. Add alternate green icing and whipped cream "garland" stripes across your Christmas Tree Cake. Let the kids decorate the Christmas Tree Cake with holiday candy "Ornaments".